An ICIWaRM team, composed of Guillermo Mendoza, John Kucharski and Jennifer Olszewski, was in Santo Domingo and Santiago de Los Caballeros, Dominican Republic from 23-25 April 2015. They primarily worked with professionals from the National Institute for Water Resources (INDRHI), the Aqueduct and Sewerage Corporation of Santiago (CORAASAN) and others on developing a Shared Vision Planning process for strategic infrastructure and management investments in water security for the Santiago region. Climate change and population growth were considered to be principal scenario planning stressors to drive decision processes. A side meeting was held in conjunction with the “Primer Congreso Internacional en Gestión Integral del Agua”. The meeting goal was to develop a potential work plan to be led by CORAASAN and INDRHI to implement a Scenario and Shared Vision Planning study to evaluate courses of action to improve delivery of water supply to the city of Santiago while considering hydropower, agriculture, and socio-environmental impacts. Prior to the workshop, the group were invited to observe a real-time decision-making meeting at the INDRHI executive office; this involved on national reservoir operations, involving weather forecasts, hydrologic analysis, reservoir volume weekly reports, and operation recommendations. 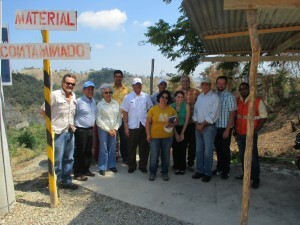 The team also met with climate change adaptation specialists from USAID and the Technological Institute of Santo Domingo (INTEC) to discuss decision-centric approaches for water resources design under climate change for water security, and visited the upper Yaque del Norte basin system (two principal dams/reservoirs and a hydropower plant).